As many of you reading this will no doubt know, it’s a tough life being a musician, especially Singer-Songwriters who don’t live in the Metropolis. But, I’m glad many still persevere. 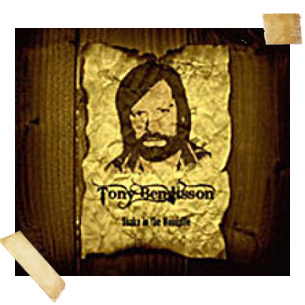 Otherwise I’d never have discovered this little gem from Tony Bengtsson. Sadly I still ‘judge books by their covers’ and the artwork can colour my judgement before I’ve even heard a word. But, Tony had my attention as soon as I unwrapped the professional-looking cover and read the bits and bobs inside the gatefold sleeve. Then, of course, there is always the opening track which can influence my opinion – in this instance Liability left my flabber well and truly gasted! It’s a great song about the break up of a relationship with Bengtsson’s grizzled but soft voice holding me captive and listening intently to every word until I was rooting for the guy by the end. Tony appears to have had something of a checkered love life if his songs are anything to go by, but I’m pleased. It means he gets to put his feelings down on paper and, in that respect, he is a very talented man and lucky to be such a capable wordsmith. Probably the finest song on the album, Rebecca, could be about a lover or perhaps a child that he has to leave behind. Whichever it is, the result is wonderful and well worth hearing. Tony even does self-pity very well, with The Fire striking a raw nerve every time I hear it. It’s Wrong ploughs an odd furrow as the man refuses to go back to the woman…she only wants him because she’s ‘lonely.’ A very nice twist, I thought. What more can you ask for? A very well-produced album of well-written songs that nicely straddle the Folk/Americana fence. The musicianship throughout is extraordinary, especially Dan Walsh on the banjo.